Frozen Synapse 2, the sequel to the 2011 cult classic turn-based strategy game Frozen Synapse, finally arrived on Steam this week. So far, user reviews are mixed, with many fans complaining of bugs and migraine-inducing user interface issues at higher resolutions. The small, four-person team at Mode 7 says it’s working quickly to resolve them. But if you stare at their game long enough, it’s a fascinating image of where the X-COM franchise could have gone. Mode 7 has been open about the inspiration for Frozen Synapse 2, which comes from the final game in the original X-COM series, 1997’s X-COM: Apocalypse. In that title, players were only responsible for protecting a single city from an alien invasion rather than the entire planet Earth. Instead of making the game less intricate, creator Julian Gollop piled on the complexity with an elaborate network of warring factions that were just as difficult to deal with as the extra-planar life forms. Frozen Synapse2 takes that model and cranks it up to 11. Every time players begin a new game, procedural generation kicks in to mix up the various factions. Set against a dystopian cyberpunk world, it makes for an interesting, if slightly obtuse, narrative filled with poorly explained lingo. The gist of it is plain enough. Players take on the role of the protector of the city, named Markov Geist, and use vat-grown mercenary clones to defend against a mysterious outside entity known only as Sonata. While the original vision was for that same procedural engine to create completely different city layouts each time, Mode 7 tells Polygon that its vision has been scaled back slightly. In my experience, the end result is no less impressive. Even more exciting is the game’s expanded tactical systems. To simply call it an X-COM clone is an injustice. Instead, imagine a tactical first-person shooter with each side controlling squads of four or more soldiers. 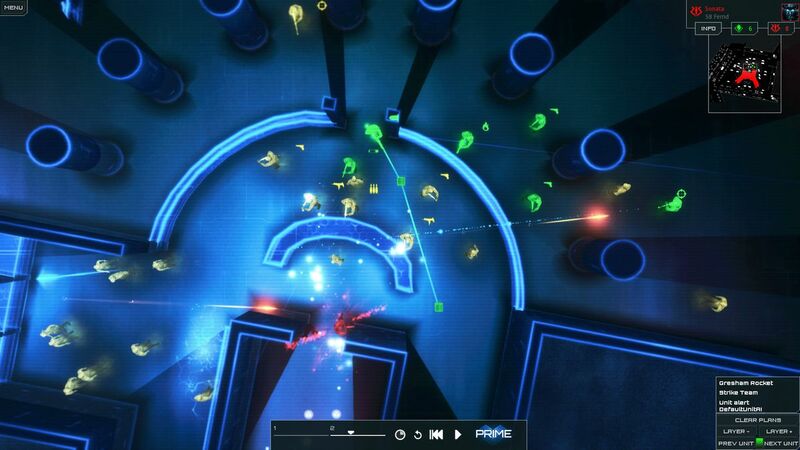 Then, rather than putting a single player in control of each soldier in first-person, Frozen Synapse2 gives a single player absolute control over every soldier in third-person. In Frozen Synapse 2’s tactical mode, allied soldiers show up as green figures and enemy soldiers as red. Yellow figures are civilian bystanders. Just as in the original X-COM and the Firaxis reboot, innocent casualties can impact mission objectives. In short, Frozen Synapse 2 delivers on the fantasy of total situational awareness. It is a high-stakes chess match, a guessing game played five seconds at a time. Thanks to an asynchronous multiplayer mode, I expect to sink hundreds of hours into this game over the next few years. While I loved the original X-COM: Apocalypse, it was a notoriously unbalanced game. There were ways to use its openness against it, ways to swarm and befuddle the AI and slowly, but surely, grind your way to ultimate victory. I’m not so sure that Frozen Synapse 2 suffers from the same issues. Already it’s surprised me by ambushing me in the open street and vicious incursions by enemy factions into my home turf. While the final product still doesn’t appear to be fully baked quite yet, I’m enthusiastic about spending more time with it as Mode 7 buffs out the dings and dents to complete their vision. It makes me wonder what the original X-COM: Apocalypse could have become if it had been released in a time where continual, post-launch development was the industry standard. Frozen Synapse 2 is out now for Windows PC on Steam for $29.99. A Mac and a Linux version are in the works. It’s worth noting that X-COM series creator Julian Gollop is working on his own spiritual successor to Apocalypse, called Phoenix Point. You can read more in our feature story, and then learn how its gameplay works from our hands-on impressions.